I am often asked, where do you get inspiration? Sometimes it might be from exterior views, sometimes from the contents of a client’s wardrobe but very often it is from a client’s favourite antique or piece of art. So often, we are given a blank canvas but with the proviso to include a favourite painting and, for me, this can often be the perfect starting point for my designs. Notice how the moody hues in the oil painting are echoed in the fabric selections for this room, here we have combined, soft greys and purples and teal blues and then added a strong dash of chartreuse and emerald green. It is the painting that pulls all these contrasting colours together. In the room above, the colour seems to flow out of the painting, filling the room with vitality. The artist has used greys, blacks and white to anchor his creation. We have followed his lead but have added shades of green to calm the vibrant shades. 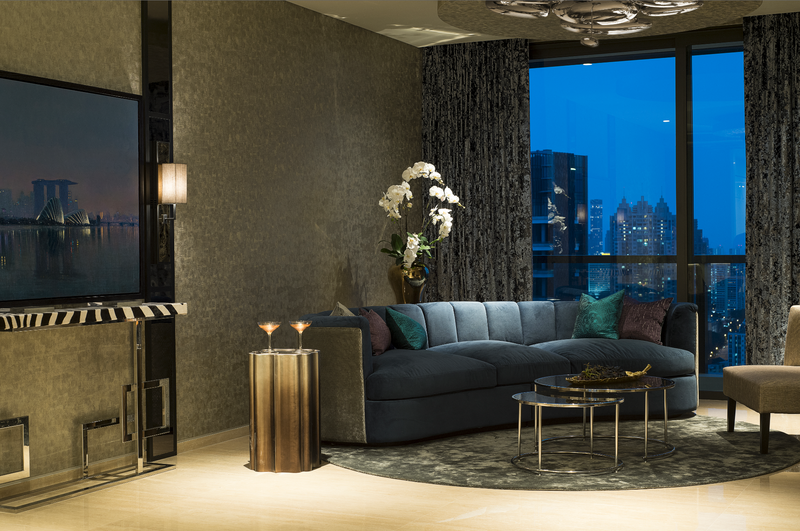 In the room below, we have echoed the shades and mood in the landscape to create a moody, intimate interior. With a painting as arresting as this one, we have deliberately kept the sofa plain. 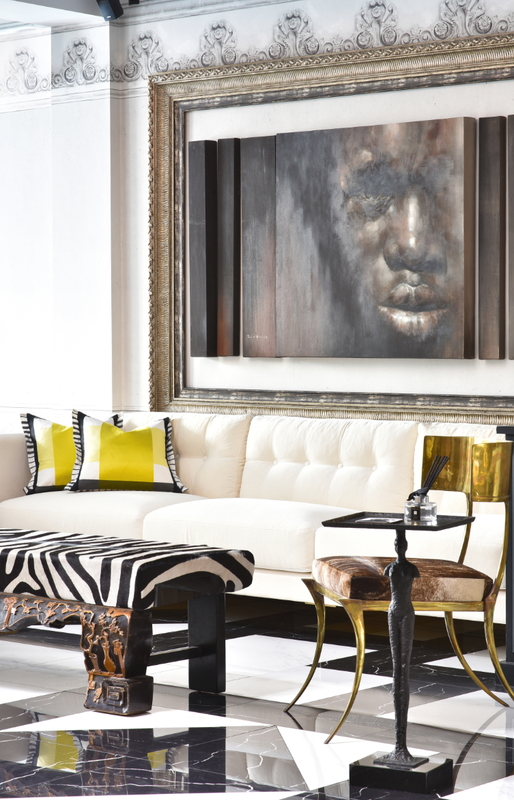 The zebra-striped ottoman echoes the African theme and provides a balancing element. Notice how the oversized frame visually extends the proportions of the painting, intensifying its commanding presence. 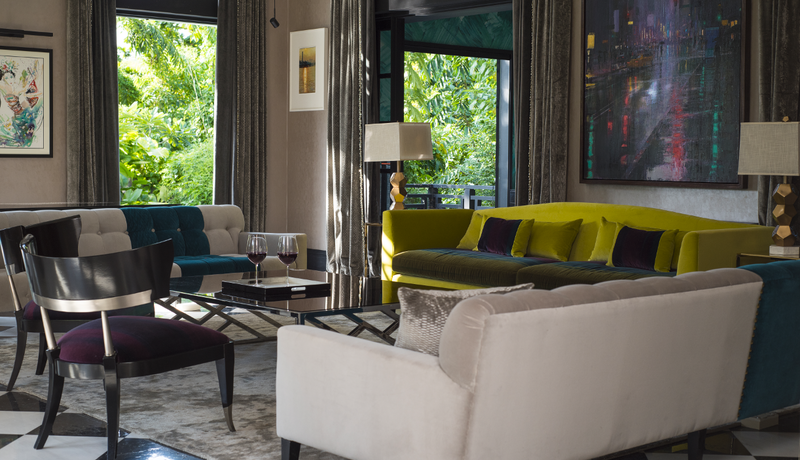 In this elegant living room, the colour choices have been drawn from two favourite art pieces. 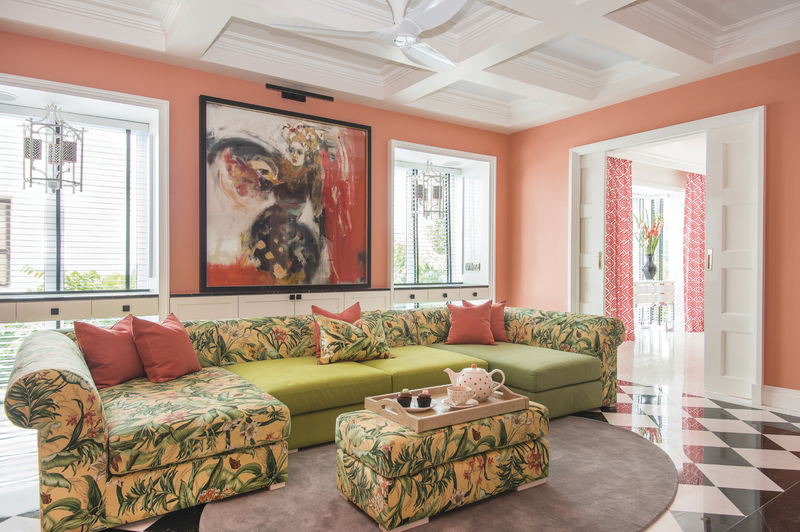 And just as the magenta in the monk’s robes, energises the painting above the tv, the shots of vibrant pink in our interior scheme adds a fresh intensity to the room. 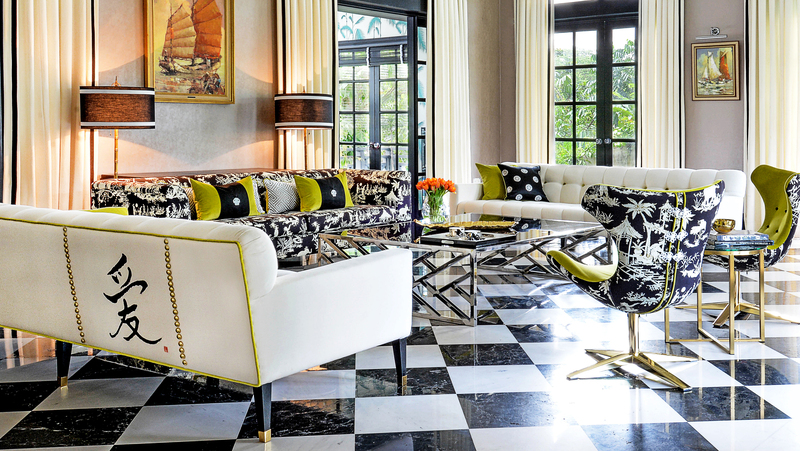 When incorporating ornate and intricate antiques, balance them by mixing in modern materials like glass and stainless steel so that the heavy pieces don’t over power the room. The oriental inspired form of the new pieces ensures that old and new work cohesively together. Here too, We have taken our colour inspiration from a favourite painting and sometimes we can create a whole concept around a favourite piece. 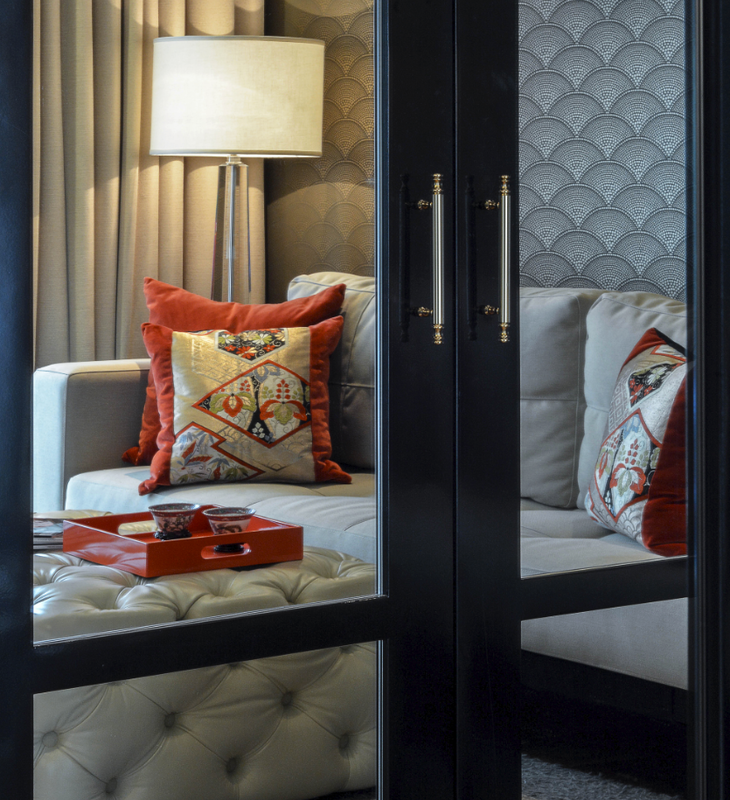 An antique Japanese silk Obi provided the design inspiration for an entire apartment! And the oil painting of an oriental boat provided the inspiration of this Chinoiserie themed room.